This entry was posted on July 26, 2007 at 7:02 am and is filed under experimental, experimental music, music review. You can follow any responses to this entry through the RSS 2.0 feed. You can leave a response, or trackback from your own site. Good review, I liked the album very much, like you say some amazing sounds from just guitar and bass. 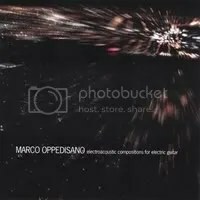 Marco Oppedisano just plain RULES! This CD is a stellar work and shows his depth and breadth as a composer and musician. Oppedisano is a genius, plain and simple. I’m enjoying the album very much and I find it highly inspiring for my own work — thanks for the review. I own this album and like it quite a bit. Marco stands as an innovator in a world of cookie-cutter, mediocre music. Not only is Marco talented, he’s also one hell of a nice guy. It is good to see music like this reviewed, thanks for posting it. Marco sent me this album, a couple of months or more ago, and I have had many gripping listens since. I find Marco’s work to be authentic, not in a slavish sense where one immediately looks for influences…..his music transcends whatever ground it emerged from initially. Authentic, performed with spirit and integrity, just all around marvellous. An amazing talent, and has been said before, a hell of a nice guy!